This is a lab manual for a college-level human anatomy course (BIOL 3446 at UTA). Despite the abundance of information readily available via Google, the mastery of anatomy requires a fair amount of memorization for quick recall. The activities in this manual encourage students to engage with new vocabulary in many ways, including grouping key terms, matching terms to structures, recalling definitions, and written exercises. As the majority of college campuses do not have easy access to a cadaver, most of the activities in this manual utilize anatomical models. Also included are several dissections of animal tissues, and a significant amount of histological examinations. Each unit includes both pre- and post-lab questions and six lab exercises designed for a classroom where students move from station to station during a three-hour period. Effort was put into equalizing the time required to perform each lab exercise, to facilitate class flow. The vocabulary terms used in each unit are listed at the end of the manual and serve as a checklist for practicals. When Malgosia Wilk-Blaszczak began teaching human anatomy at UTA she realized that while there are many commercially available manuals which incorporate a lot of human physiology, none of them focus solely on anatomy. She decided to create a manual for anatomy labs that could fill that void. The first version of this work was created and used in anatomy labs at UTA. The idea of publishing the lab manual as an OER came to her courtesy of Michelle Reed, Open Education Librarian at UTA. To make this leap to an open platform, she enlisted the help of some of her best students. In Fall 2017, one year prior to the publication of this work, Wilk recruited a group of three excellent undergraduate teaching assistants. These students worked with UTA Libraries to identify openly licensed images and incorporate them into the text. Libraries’ staff assisted in migrating the resource to Pressbooks, where it could be easily exported into a variety of formats. Furthermore, we conducted student surveys to gather feedback. Wilk’s teaching assistants have always been an important part of her pedagogy. With their assistance, she was able to complete and openly publish this anatomy lab manual. The students put in the hard work to change all illustrations to Creative Commons licensed images and ensure proper attribution of all the images used. The student contributors, Kevin Alford, Andrea Compo-Valez, and Victoria Dorch, now alumni, reviewed and edited the resource, and are listed as co-authors of this manual. Ultimately, open manuals reduce the cost to students while customizing the information and visuals required for class. In addition, the digital copy of the manual allows students to access homework and exercises wherever they are and is easily obtainable on the first day of class. Open manuals are also dynamic works that can be adapted to suit the needs of other institutions or groups that wish to explore the topic but do not have a solid framework to do so. The resulting OER is being piloted in human anatomy labs in Fall 2018 and will be revised following the pilot period with input from current students and lab instructors. It is our hope that this extension of Wilk’s class will open the door to connecting our courses to broader collaborations and student input. Dr. Malgosia Wilk-Blaszczak has taught human anatomy and human physiology courses for 30 years to medical and nursing students, and currently to undergraduate students at University of Texas at Arlington. She holds an M.D. and a Ph.D. in Neuroscience from the Warsaw Medical University. Ever since she discovered her father’s anatomical fold-out “manikin” as a child, Dr. Wilk has has been enamored by all aspects of the human body. 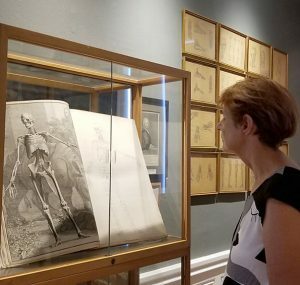 In addition to teaching, she loves old medical illustration and never misses the chance to see them in museums when she travels.